Upon entering Uma Nota, guests pass through the outdoor seating area into the spacious square-shaped dining space, with a well-stocked bar on one side and high chairs filling the room, with window seats overlooking the semi-open kitchen. Seating is scattered across the room but neatly arranged, combined with dark wood and painted murals throughout the space that give the space an exotic vibe. We recommend the seating at the bar for small parties where bartenders interact with guests and recommend special cocktails, whereas bigger parties are advised to arrive early as the restaurant offers no advanced reservations. Uma Nota’s menu offerings are modestly divided into small plates, ceviches, skewers, mains, and vegetables, each with five to six items to choose from. We began with deep fried dumplings filled with chicken and okra. Served with a spicy chilli sauce, these golden morsels are similar to croquettes, where mashed potatoes encase a juicy filling of shredded chicken and chopped okra. Crackling pork belly with spicy tonkatsu sauce is satisfying, where the twice-cooked pork belly remained tender with thin and crisp crackling matching the best pork scratchings we have had. Skewers come in pairs, and the portobello is generously smothered with herb-rich chimichurri sauce, while daily specials like chicken hearts stay tender with a creamy grilled onion mayonnaise. 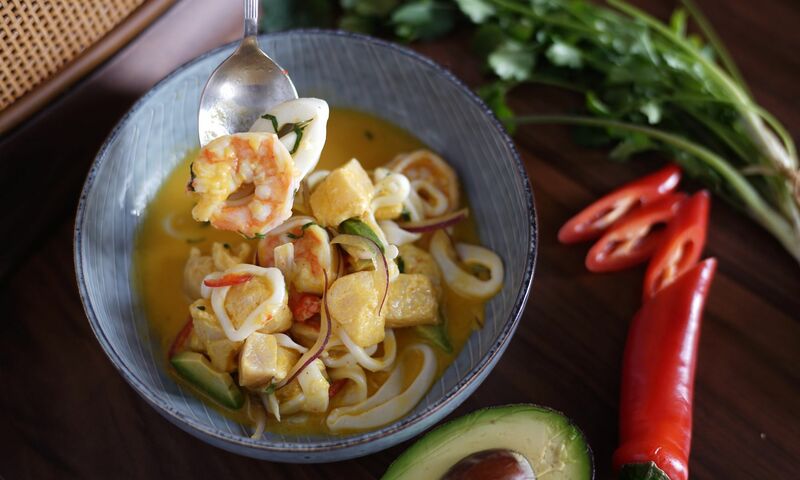 We love the ceviche Amarillo, where shrimps and squid ringlets were marinated in ‘tiger’s milk’, or ‘leche de tigre’, a traditional ceviche staple where lime juice, coriander, and yellow chillies are blended to a milky consistency and mixed with raw seafood. Mains were lacking in options. The grilled flank steak is rare and juicy throughout, paired with watercress and black-eyed peas salad and buttered bacon cornbread crumbs on top. The side dishes tend to be on the dry side, and a good sauce was needed to accompany the steak. Marinated pear salad is a winner, as the mixed greens and hearts of palm are lightened with clementine orange sauce for a refreshing citrus zing. Uma Nota offers no desserts, except tiny brigadeiros, a sweet treat similar to a chocolate truffle, combining condensed milk and cocoa powder and nuts. Staying true to the concept of a boteco, or a cocktail gathering spot in Brazil, Uma Nota impresses with a bar menu featuring tropical cocktails with hints of Japanese influence throughout. We particularly enjoyed the Classic Caipirinha, made with lime, sugar, and cachaça, a South American sugar cane liquor. It is mildly sweet, zesty and served with lots of ice. The Menina Geisha is a green concoction where gin meets St. Germain elderflower liqueur. The lime and cucumber syrup allows the cocktail to refresh the palate in between dishes. Service at Uma Nota is impressive and friendly. Greetings are in order followed by a brief introduction of the restaurant concept and menu offerings and specials. The service staff is mostly knowledgeable with ingredients that may seem unfamiliar to guests, and they also offer sound portion-control and notable item recommendations. A dinner for two including shared small plates, mains and drinks amount HK$1,150. With great ambience, solid sharing plates and cocktails, Uma Nota is off to a great start bringing the street vibes of Sao Paolo to enliven the Soho neighborhood.